LBRY is a free, open, and community-driven digital marketplace that enables content sharing, monetization, discovery and consumption. 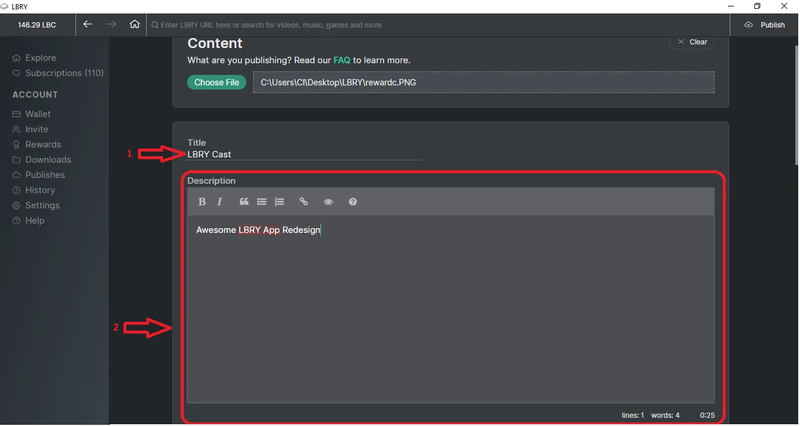 Publishing in LBRY is the process of sharing your content on the network. You have the ability to set the price per view (can be free too) which is paid directly to you. 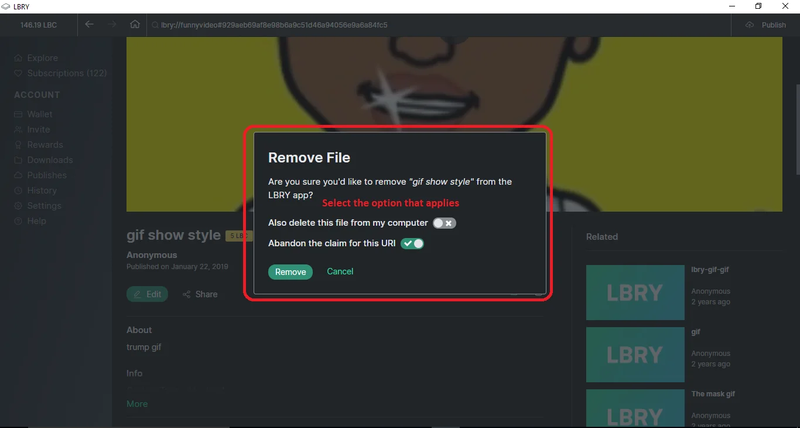 This process involves making a "claim" in the LBRY blockchain which will be used to retrieve the content via a URL. Content can either be published anonymously or to a particular channel/identity which groups content in a single location. 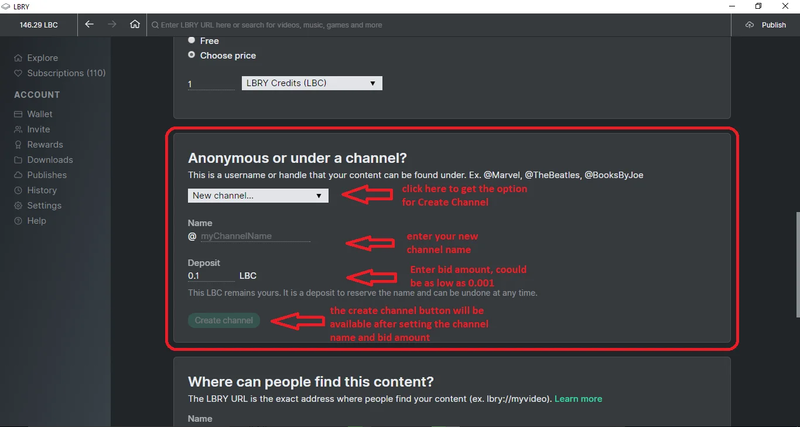 Both channels and claims require a deposit (bid) of LBRY Credits (LBC) in order to reserve their location on the LBRY network. This deposit will be deducted from your balance as long as the claim is active. See our naming and transaction documentation for more information about claims, bids and transactions. 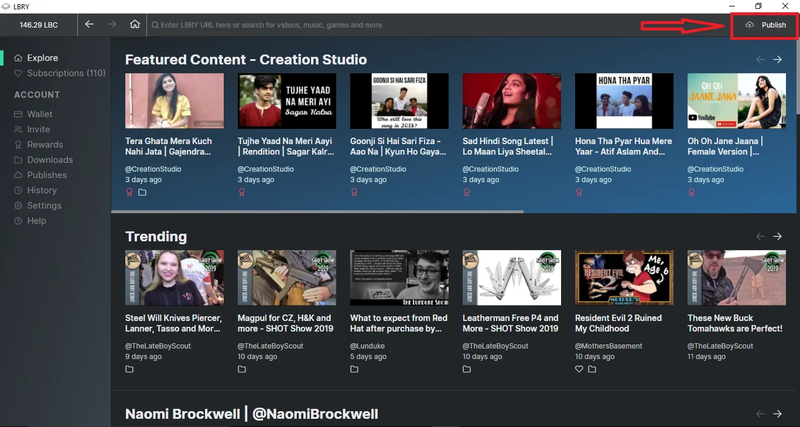 Want to get your content featured on the Discover page? Check out Community top bids. If you don't have LBRY yet, download it here. Click the Publish button in the top right of the screen. Under the Content section, click Choose File. 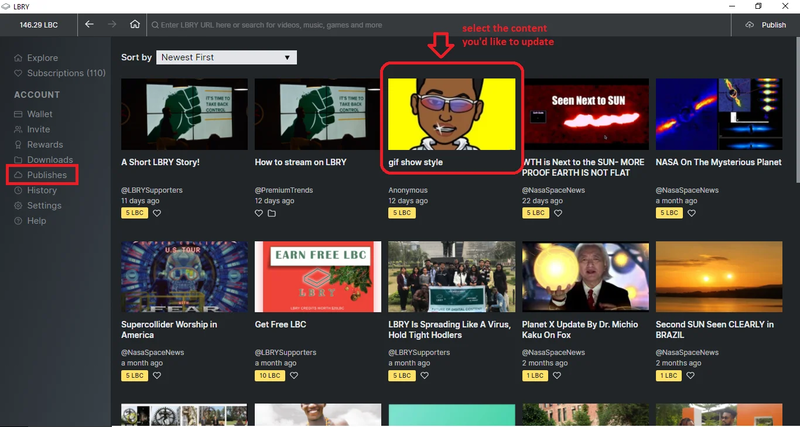 On your local machine, select the content you wish to upload to LBRY. LBRY accepts any HTML5 format for video streaming; the full list can be found here. This means a web-optimized MP4 file is the best format. 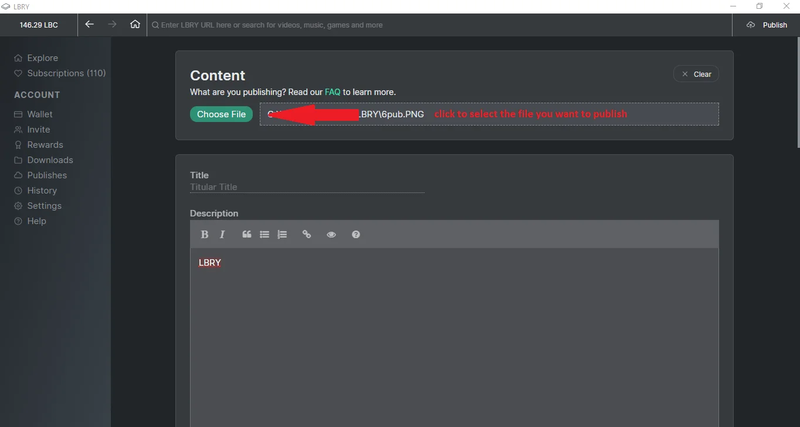 Other file types can also be uploaded, but won't be streamable via the LBRY app. Choose a Thumbnail or Thumbnail URL for your content. The Thumbnail URL is a hyperlink to an image file which will serve as a preview for your content. 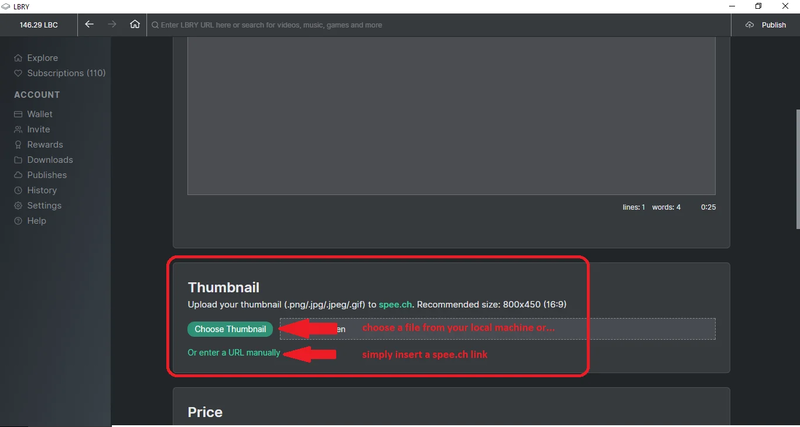 It can be any image/GIF URL, or you can use spee.ch to host it. The default pixel size is 800x450, but the app will scale it up/down. Images uploaded directly from your local machine as Thumbnail will be uploaded to spee.ch. Please make sure to check the option for mature audiences if your Thumbnail is categorized as NSFW (Not Safe For Work). Otherwise just click "Upload". Under the Price, first, determine if you want to make your content free or set a price (in USD or LBC) per view. You have the option to select/create the channel you would like to publish the content under. If no channel is selected, it will be posted anonymously. Type in the URL you want the content to be found under, along with a minimum of 0.0001 LBC deposit for the upload (current limit, may change in the future). If you are trying to outbid a user-friendly/common URL, the system will suggest a minimum bid to take over the content at that vanity URL. There may be a delay for this takeover. Check out the #content channel on our Discord chat to see this information (search for your URL). For more details regarding the URL or bid, check out our naming document. Next, there are selections for Maturity, Language, and License. The default values are set as follows: Maturity being unchecked, which means the content is safe for all audiences, Language is set to English, and the License is set to None. If a change is needed, click the dropdown menus and select the appropriate choice. Please check the Mature audience only option if your content is NSFW. The file will process in the background and will be added to the LBRY Blockchain. Larger files will take longer to upload depending on your network speed. Please leave LBRY running while your content is in the "pending confirmation" mode. This page will automatically refresh and you will be notified when the publish is completed. 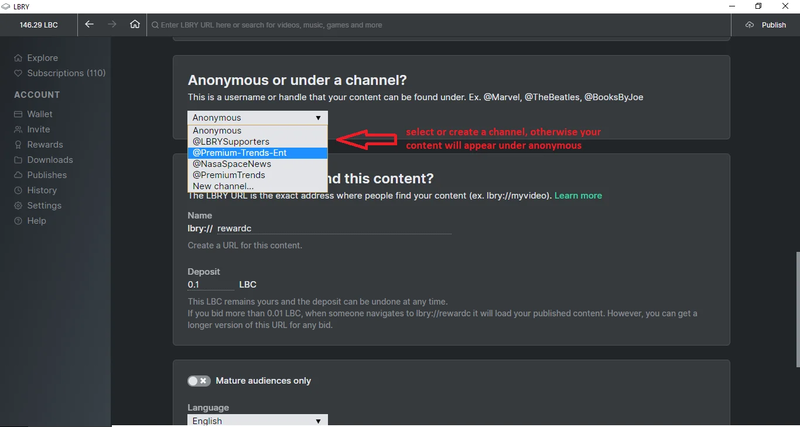 You can continue to use LBRY while the upload completes. Once the application loads, click the Publish button in the top right of the screen. Select a source file and then in the Channel Name section, click on the dropdown menu and select New Channel and then declare the name you would like for your channel. For more details on different channel types, see our write up on naming. Once your name is selected, there is a Deposit section that is below. It requires a minimum bid of 0.0001 LBC (see more on deposits here). Please ensure that you have enough LBRY credits in your wallet to cover the bid amount. There is also a small network fee associated with the creation of a channel. Click Create Channel once you have entered your bid amount. You now own lbry://@channelnameyoubidon#Claim_ID and lbry://@channelnameyoubidon (the vanity name without a claim id) if you are the highest bidder. How do I delete my content and reclaim my deposit? Click on the Publishes tab from the leftside of the app. 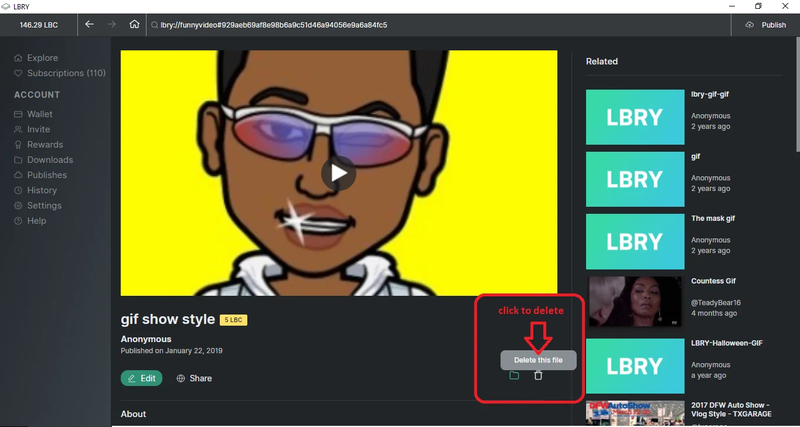 Click on the Delete icon. If the delete icon does not respond, try downloading the content locally and try again. There will be two options. Delete this file from my computer and Abandon the claim for this URI. Select the option that applies. Abandoning your claim will release the LBC back into your wallet (99% of the time you want to select this). Warning: Deleting content is permanent. Please make sure this is what you want to do before confirming the deletion. Click Remove. If you abandoned your claim, you should see the deposit back in your balance shortly. How do I edit my existing Published content? Select the content you want to update. You can now edit your claim information. No need to re-select the file if it's the same one or has the same url. When you are done, click Edit. Can someone tip me for my content? Yes, check out how tipping in LBRY works by going here. Can I increase my bid amount? Yes, the claim can be edited to increase the bid amount. Go into your published claim and click Edit. Then on the bid screen, enter your desired bid. Confirm everything else is correct and click Edit. An update will be created with your new LBC bid for this claim. How can I tell if someone is downloading my content? 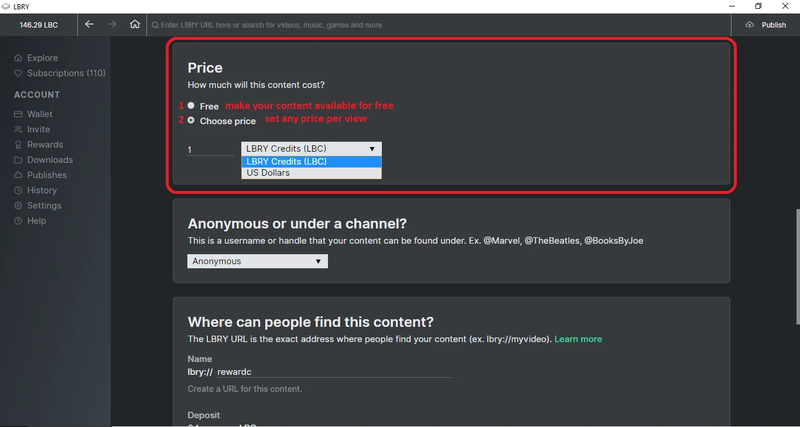 Currently, this is only possible if you set a price for your content - you will see transactions in your LBRY wallet as people purchase it. In the future, we will add these types of statistics to LBRY. My video doesn't stream in the app, what's wrong? The in-app video player's streaming capabilities are limited to MP4 files which are web-optimized (metadata is contained at the front of the file). If it's not web-optimized, the MP4 file will still play in the app, but the entire file will need to be downloaded first. AVI/WMV/MOV file formats are also not supported by the in-app player. They can be shared/downloaded but will need to be played externally. I shared my URL, but others can't download it. What's going on? Since LBRY is a Peer-to-Peer network, it requires that your device is accessible to the internet. 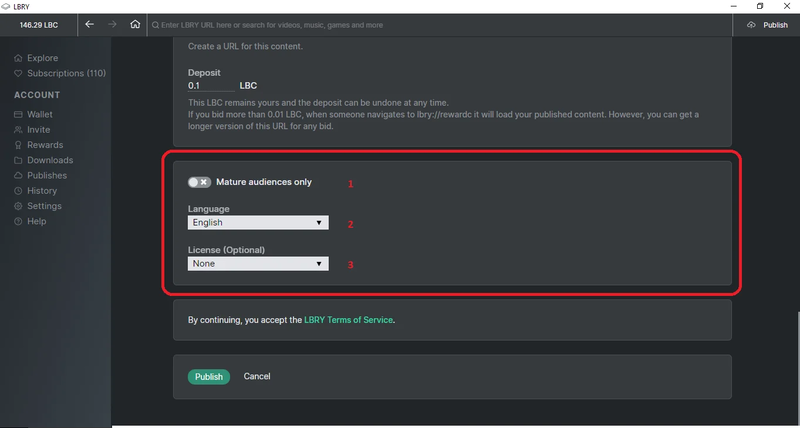 LBRY also runs servers to assist in content hosting, but this process may fail if your device cannot send it to us. By default, the TCP sharing port is set to 3333. If your network is properly configured and LBRY is running, a port status check on TCP Port 3333 should pass on this port checking tool. If it fails, you can check if UPnP is enabled on your router or forward TCP port 3333 manually. If you need assistance, check out the help page on how to reach us. Where is my Channel and content saved locally? Channels and content claims are saved to your LBRY Wallet along with your LBRY Credits. When creating new channels or content, it's a good practice to backup your wallet afterwards. How and where can I share my content? 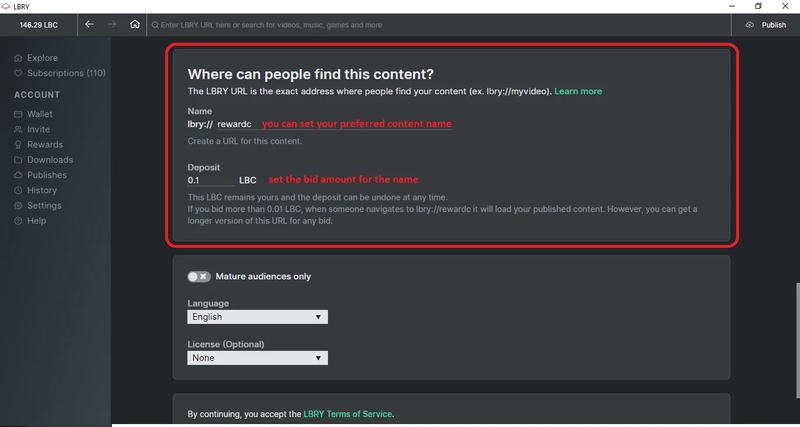 LBRY URLs can be shared with anyone, but they will require the LBRY app in order to view the content. If the content is free and public, it can be retrieved through spee.ch by going to https://spee.ch/ or https://spee.ch/<@channelname>. 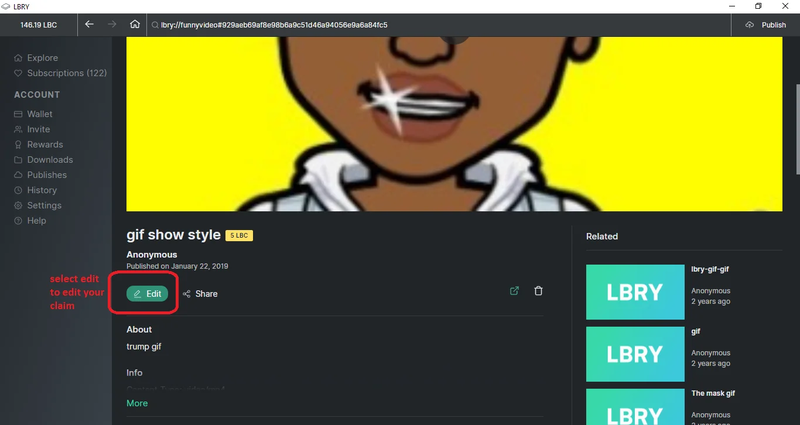 You can also share the content on our #publishers channel on Discord where we have a vibrant community with thousands of users. I'm an advanced user, is there more I can poke around with? Advanced users can check out the API/CLI documentation for command line / API options. I'm confused and need some assistance, can you help? Of course, we are always here to help! Check out our help page on how to reach us.